It’s been a busy week for Springwell Running Club with members taking part in events in Ballymoney, the Kingdom of Mourne and a few trips further afield for Marathons in Newport, Wales and Dusseldorf in Germany. Wednesday 25th April saw the first of this years races hosted by Springwell RC, with the 6th annual Purple Ladies 5k, sponsored by the Grant’s Electrical Services Group. Starting and finishing at the Joey Dunlop Leisure Centre in Ballymoney, this year’s race attracted almost 300 competitors for the ladies only race. The showers of the afternoon cleared and the race started, albeit in a cool breeze, in bright evening sunshine. The race positions were quickly established, with the in-form Ciara Toner (Springwell RC), establishing a lead that she was to maintain, and increase despite the best efforts of the very talented Gemma McDonald (Ballycastle Runners AC). Ciara crossed the line to win in a time of 18.05 with Gemma second in 18.55. Talented multi-sport athlete Sonia Knox (Riada Triathlon Club) completed the podium with 19.12 for third place while Deborah Gilliland placed fourth in 19.26 and Veronica Nellins (unattached) fifth with a time of 19.51. Race Director Kenneth Bacon would like to thank everyone who assisted in making the event the success that it was. Ciara Toner leads the GES Purple Ladies 5k from Gemma McDonald, Sonia Knox and Deborah Gilliland. 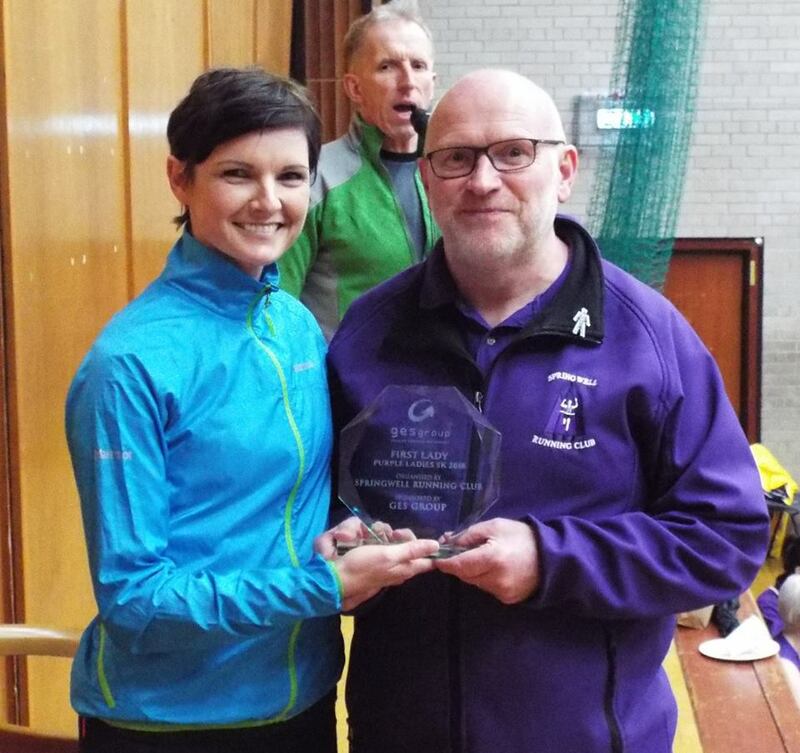 Race Director Kenny Bacon presents the GES Purple Ladies 5k trophy to Ciara Toner. The third race in the 2018 Hill and Dale series took place in Rostrevor on Thursday 26 April. The changeable weather in the days before the race kept the runners guessing as to what conditions they would be facing in the Mourne Mountains. Thankfully Kilbroney missed the predicted showers, the wind had dropped and the sun was out just in time to provide ideal conditions for the race, as well as the opportunity for some spectacular views. Springwell RC’s mountain running specialists gave a good account of themselves with Alex Brennan finishing second in the M45 category and Oisin Brennan third in the MJ. 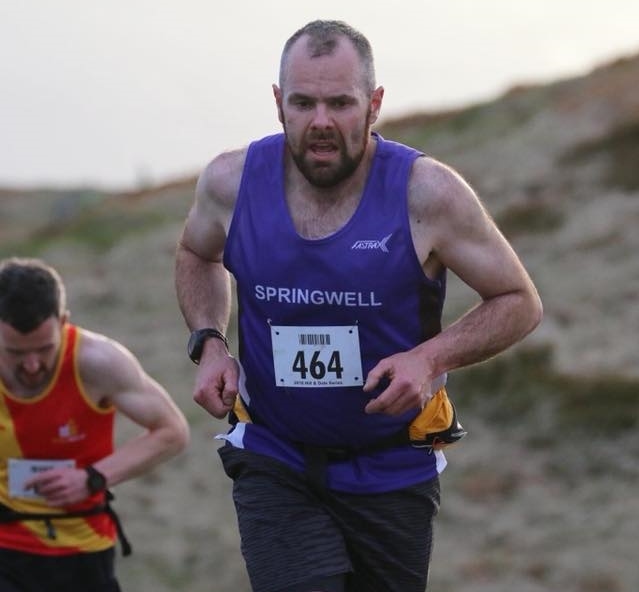 Springwell RC’s Barry Mullan at the Newcastle AC Hill & Dale Series. The Newport Marathon took place on 29th April with almost 3400 runners taking on the challenge. Running a marathon for the second consecutive Sunday was Springwell RC’s Andrew Kincaid who completed his second marathon in a four marathon challenge. In cooler conditions than last Sunday’s London Marathon Andrew produced a quicker time of 4.54.11 and is now recovering before his next marathon in Belfast on the 7th May. Andrew is completing four marathons to raise much needed funds for multiple sclerosis and will, hopefully, finish his challenge at the Edinburgh Marathon on the 27th May. Running through the city of Dusseldorf and along the banks of the River Rhine the 2018 Dusseldorf Marathon attracted over 3000 competitors to the city on 29th April for this popular event. Springwell RC’s Alistair Shaw at the Dusseldorf Marathon. Springwell RC was represented at this event by Alistair Shaw who finished 617th in a time of 3.28.28. Alistair will be one of the official pacers at this year’s Belfast Marathon on the 7th May.